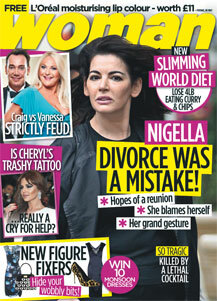 In this week’s issue, was Nigella’s divorce a mistake and it’s Craig vs Vanessa, is a Strictly feud a foot? This autumn step out in style with our favourite caramel and toffee shades for a tempting new spin on your workwear. Make your hair work for you, we show you how to cleverly tweak your hairstyle to enhance your features. We’ve teamed up with Slimming World to offer you FREE membership and save £35 when you join online, exclusive FREE L’Oreal duo compact worth £11 and Jamie Oliver gives us top tips to help save you money plus two delicious recipes to try! As we patiently wait for the new series of Downton Abbey, Woman meets the real life Lady Cora to find out what goes on behind the scenes. All this and lots more, only in this week’s Woman – out NOW.